Rajat ji says that case will be on Kapil today and not on him. He also tells kapil that he has already prepared all the charges against him like on love letters being written for him. He says that he will make charges on behalf of all the people. Rajat ji starts his Aap ki Adalat while kapil is seen waiting inside the witness box and Sidhu is being made the judge. 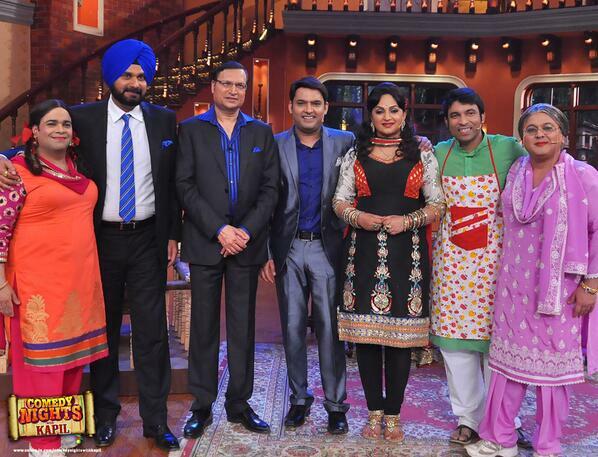 All the husbands in India are angry with Kapil ? All the women want their husbands to be funny like Kapil ? Women says that they show their husbands repeat telecast of Kapil’s show so that their husband can become funny and develop sense of humor?. Kapil: Women cannot be 100% satisfied.. they will have qualms in spite of their husband’s sense of humor. He cites SRK’s own romance with his heroines on-screen and not much on-screen romance with his wife – Gauri. He then cracks a joke on Sidhu. He counters Rajat ji and asks him whether his wife questions him..
Bad english skills of Kapil. Though, he says I love to you to girls and speaks nicely with them ? How does he speak english with them ? Kapil: He speaks some english lines and also tells that in english movies there are not much english dialogues and have more action..
Raju the servant comes with tea and special snacks…Raju speaks on some charges he wants to make against Bittu-his boss. The first charge that he didn’t pay raju his salary for one year and because of this he cannot pay taxes though he wants to. Rajat ji: Proposes them to switch their roles for 1 week. 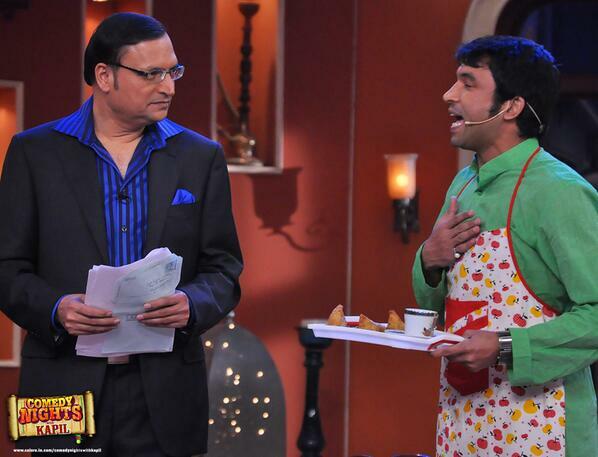 Raju starts acting like a boss and behaves same like Kapil though he is dressed in the same servant clothes. Kapil: says that Raju doesn’t have any qualities of a boss..After some more jokes, both again comes back to their original roles.. 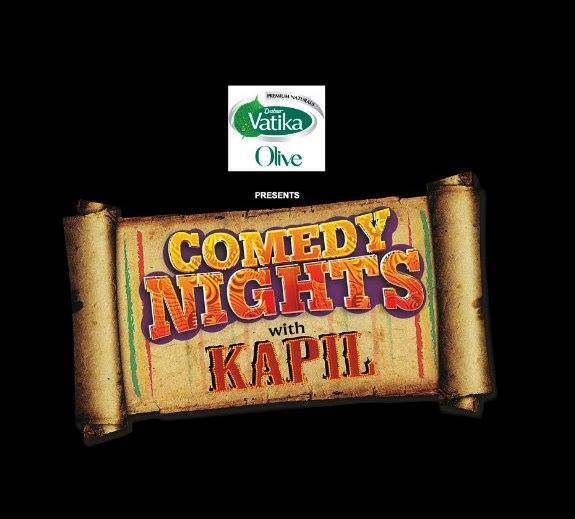 Restaurant owners are annoyed with Kapil. Because their business got affected badly on weekends as people started preferring to watch CNWK instead of spending time at the restaurants ? Kapil: says that for good health, 7 pm is recommended by doctors for dinner. And even goes on to extent of saying that his show is much better than doing Yoga. He says that people should eat at 7 pm and watch his show with ease at 10 PM. Daadi comes in a bang with her hichakki hichakki sound.. She says she drinks because of helplessness..She goes to Rajat ji, cries and wants to charge Bittu..
1st Charge of Daadi against Bittu: That bittu didn’t make her a great grand mother. Rajat ji: responds that kapil needs to do that. Kapil: He tells that as there is no privacy therefore he doesn’t think of making Kids..
Kapil: says that he doesn’t know romance..
Rajat ji: tells that Kapil talks a lot and flirts with Priyanka, Deepika, Malaika and then how does he say that he doesn’t know romance..
Kapil: Tells that Rajat ji watches his show with much care but still sticks to his point of not knowing how to do romance. Daadi becomes angry towards kapil after hearing his inability to do romance. Daadi says that she will show how to romance and dances on Ooh la la song from the movie – The Dirty Picture. Daadi then goes to the witness box for facing charges and Rajati ji interrogates her. He tells about her alcohol expenses from the time the show started. He tells that she drank 127 bottles of Rum, 52 bottles of Whisky, and 16 bottles of desi liquor. She tells him to pay the bill as he has all the details of her drinks. Another charge on Daadi: She doesn’t respect celebrities. Rajat ji: says that out of 60 episodes, 54 times she tried not so good behavior with male actors. She says that kissing comes natural to her and that is a shagun ki pappi. More charge on Daadi: Whenever some celebrity comes, Daadi speaks about a favourite line to them – Imaarat bhale hi kamzor hain magar buniyaad abhi bhi buland hain..Rajat ji asks what is the meaning of this saying…can you say to the audience the meaning ? Daadi replies ..while people chanting Daadi..She shows her body which is kamzor. and then goes to tell about her buniyaad which is the kissing ability and is strong. She then approaches Rajat ji..but he stops her and gives her two choices: either to go ahead with shagun ki pappi or take alcohol bottle from inside the home. Daadi chooses the latter and goes to fetch the alcohol. In this way, he escapes from Daadi’s kiss. Rajat ji speaks and plays the same trick that Kapil does to celebrities – Did you ever thought that he will come on his show ?.. Kapil replies that he was sure that Rajat ji will come to his show..
Bua comes in now and welcomes Rajat ji..She got the news from Daadi about him. Rajat ji says that she can make charges on kapil. She says the main charge is that kapil doesn’t allow her to propose to actors on the show. 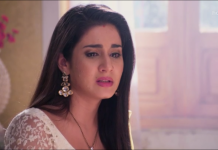 She asks Rajat ji to open up with her in his speak. 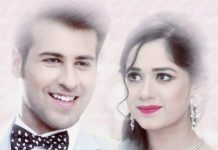 He responds by saying that Bua told 222 times on the show that she is 22 years old. He shows Bua’s birth certificate which be brought with him. On seeing this, suddenly Bua becomes annoyed. Sooner, she calms down and says that they can make a breaking news and for this they need to marry..
whom to vote in this general elections ? Rajat ji: First thing is that we should go out and vote. He tells about their TV program which focuses on each candidate and tells people to visit their site to get info on those candidates before casting their votes. Kapil: says that Rajat ji knows a lot about all political parties, Did any minister has ever asked him to show only positive things about him ? Rajat ji: He says that thing never happened to him but what he knows that the politicians have only one slogan – We will not change. Kapil: Aap ki adalat is running since 21 yrs by Rajat ji. With whom you got the most fun or memorable moment? Rajat ji: He is happy and got much fun today with Kapil on this show. After their rendezvous in an aircraft together, he prepared his mind to interrogate kapil one day on his own show – CNWK. Kapil: How was the journey of him until today ? Rajat ji: His story is painful and not very happy. He tells about his childhood days. He had an old father, old mother, sister who were all sick and 7 brothers so 10 members in all. They used to stay in a 10×10 small home. Due to scarcity of space, they used to sleep on racks stacked one upon another..For bath, they used to go out on the street’s corner and while returning home gets 2 buckets of water for their sister and mother respectively. He studied at railway platforms. Also, they ate food sometimes, and somebody used to get school uniforms from donations. And the school was very basic. They even don’t have money for mother’s health and their aspirations were small like getting a bank job was a luxury. He even now remembers those days. Kapil says that once you have will power, and determination then you can do anything. People applauds him on sharing things about his life. He says that people should dream as his father always told him to dream and cites an example when his father told him that – he should do something that he will come on TV and people will watch him..
Kapil: Who was the most toughest to get on the Aap ki Adalat ? Rajat ji: Dilip kumar, he tried a lot to invite him on the show. Dilip saab initially agreed and also Javed Akhtar was decided as judge. But finally, it didn’t worked out. Kapil: Did he ever make charges on his wife ? Rajat ji: Can anybody challenge the supreme court judge ?..It meant that he cannot challenge his wife. Kapil: Any one person that has made him silent on his TV show -Aap ki Adalat ? Rajat ji: Ram Jethlamani. He told him that he has two wives and Ram ji responded that both his wives are much happier than Rajat ji’s wife..thus making rajat ji silent.. Audience speaks: How does he tackle and make sure people speak truth on his show ? Rajat ji: He tells that when our current PM Manmohan singh came on his show. At that time, Manmohan singh was an opposition leader. He says that once he started speaking, he spoke a lot contrary to other people’s expectations. Audience: Asks Rajat ji on his favorite heroine whom he wants to invite and put charges repeatedly ? Rajat ji: He cites Katrina Kaif and says that Salman and Ranbir spoke about her but says that his personal choice cannot be disclosed as something should remain inside. Audience: Until now on his TV show, which one did the best acting, politicians or actors ? Rajat ji: Actors don’t do much acting and they are honest, politicians do acting fully when they come on his show. .Rajat ji says that he does not know about Sidhu whether he is an actor or a politician. Audience: How does he entertain his wife ? Rajat ji: They go to places where people don’t see India TV. Kapil says that place is Mongolia. This audience came from Chicago, United States of America. She shares about her husband who never watched hindi serials/movies but now have changed and started watching kapil’s show regularly. Her husband also explains kapil’s show to his american friends as well. Kapil thanks her for their love.. Audience: Right now, ordinary people are annoyed with politics, what will he do to anybody who wants to bring instability in India ? Rajat ji: says that he will not leave those people easily. Audience: Politicians eat so much ? why they don’t get indigestion? Rajat ji: Because they eat real things- all natural things..Again the audience comes from the share market business of Mumbai. Audience: Recently Italy has elections and their current PM is just 38 yrs old? Who is the young leader in India? Rajat ji: Until the time people don’t have clarity on their leader, let’s give a chance to Kapil for becoming the top leader of our country..
Palak comes in and calls loudly with a Paani Paani song sung by Honey singh. She dances a bit and says that she doesn’t believe that rajat ji is here.. Palak wants to make charges on Bittu as he is a very bad neighbor. Whenever she asks something, she never got anything. She speaks on language spoken in courts – Who is faazil dost in courts? Rajat ji responds that faazil means who is wise and intelligent.. Palak then speaks on taazi raate hind then rajat ji says it means the last night..
Palak: Says both are sharma’s but Rajat ji does better comedy than kapil and today only rajat ji is doing comedy. 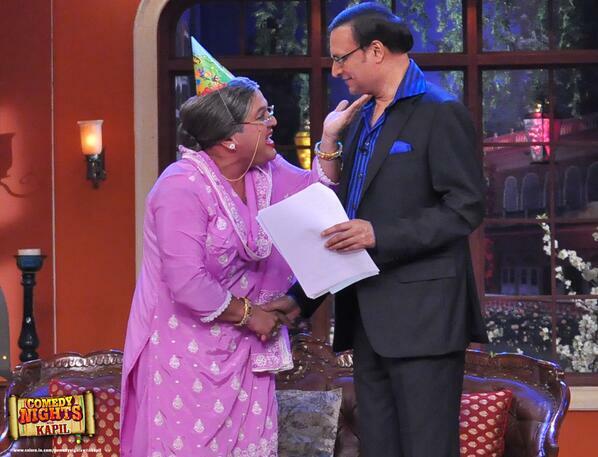 She puts her next charge on Kapil. Charge: Kapil always sees a buffalo when she comes ? Rajat ji says that her charge is correct and then says that if anybody doesn’t have a mirror then you should gift them a mirror pointing that indeed Kapil is right in seeing the buffalo. Rajat ji was in his wits to take a U-turn.. Palak responds by her trademark Ooo. sound. She then speaks about becoming a news reader at India TV. Rajat ji says that an audition is needed to choose a news reader. Palak gives a funny audition by speaking funny lines on Dabangg dabangg, kajra song, breaking news..tamanche pe disco song..Rajat ji says that her diction should be good to become a good news reader. He tells her to repeat the following lines five times- Peth Oonchi Ooont ki ya Poonch Oonchi Ooont ki.. she successfully repeats it.. Now, comes the turn of Kapil and he fumbles in the first time and makes a joke..He tells palak to repeat another time, but she couldn’t do at this time.. She says that now she cannot become a news reader and Rajat ji tells her to become a reporter instead. Rajat ji invites Bittu family and asks sidhu to give the judgement..Sidhu tells that Kapil is indeed to be charged and booked, and his charge is that he makes India happy. His punishment is that he live thousands of years and make all India happy. Kapil thanks Rajat ji and then Rang de basanti movie title song is played ending the show on a happy note.